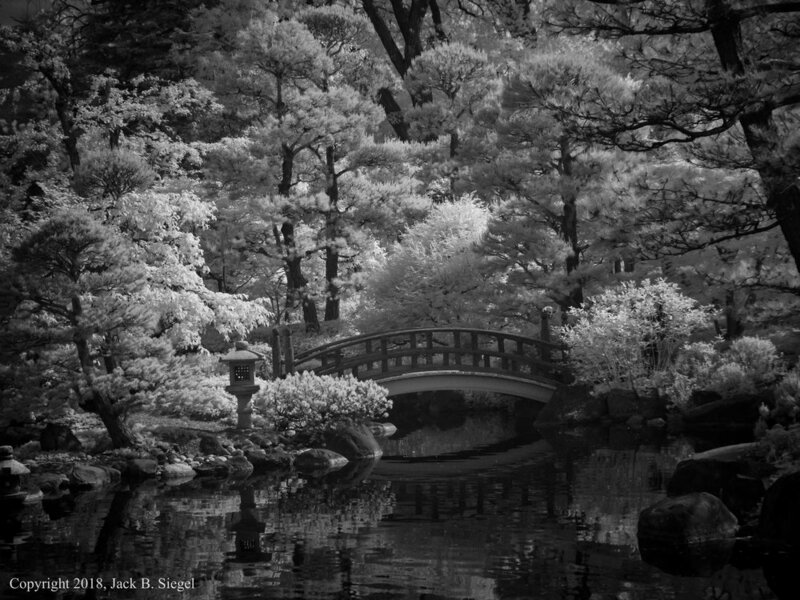 I have always enjoyed the Japanese garden at the Chicago Botanic Garden. Yet, it always feels hot and overexposed. Everything is in plain site. Not a whole lot of mystery. 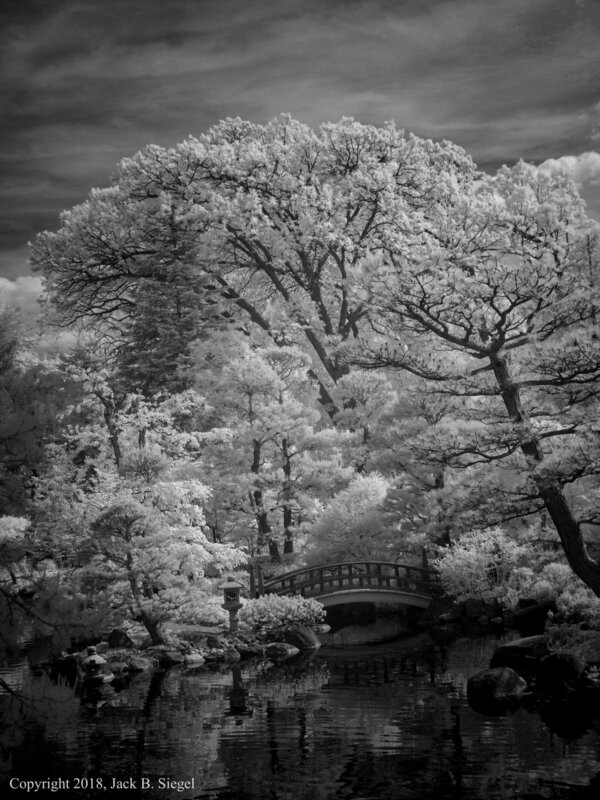 That's certainly is not the case with the Anderson Japanese Gardens located in Rockford, Illinois. 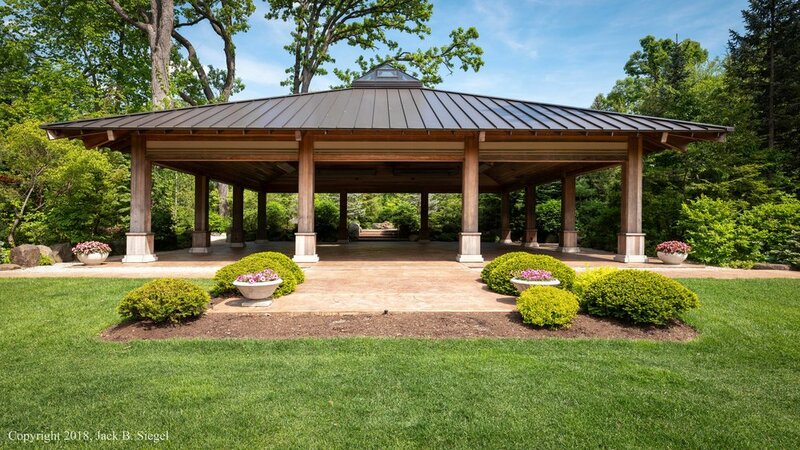 Just an 80-minute drive from Chicago--assuming the Kennedy isn't gridlocked--the Anderson Gardens reward close scrutiny, as in, "I didn't notice that lantern the first time I passed it." 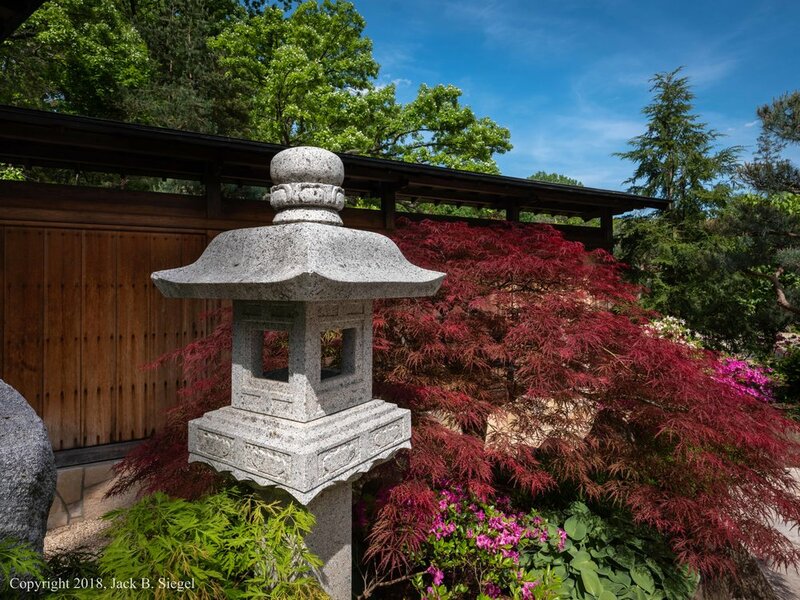 The 12-acre site was once the home of John Anderson, a successful Rockford businessman, who was inspired by a visit to the Japanese gardens in Portland, Oregon. Construction of the Anderson Gardens began in 1978 under the guidance of Hoichi Kurisu, a master landscape architect who studied in Tokyo, Japan under Kenzo Ogata. Kurisu began his career as the Landscape Director of the Garden Society of Japan. In 1972, he formed his own design firm. The cover image depicts Nishi No Taki, the central waterfall in the garden. It took three years to construct it. Today, 1,400 gallons of water flow over the falls every minute. It is spectacular, particularly when viewed while seated on the rectangular Zen-like stone bench set back from the falls. 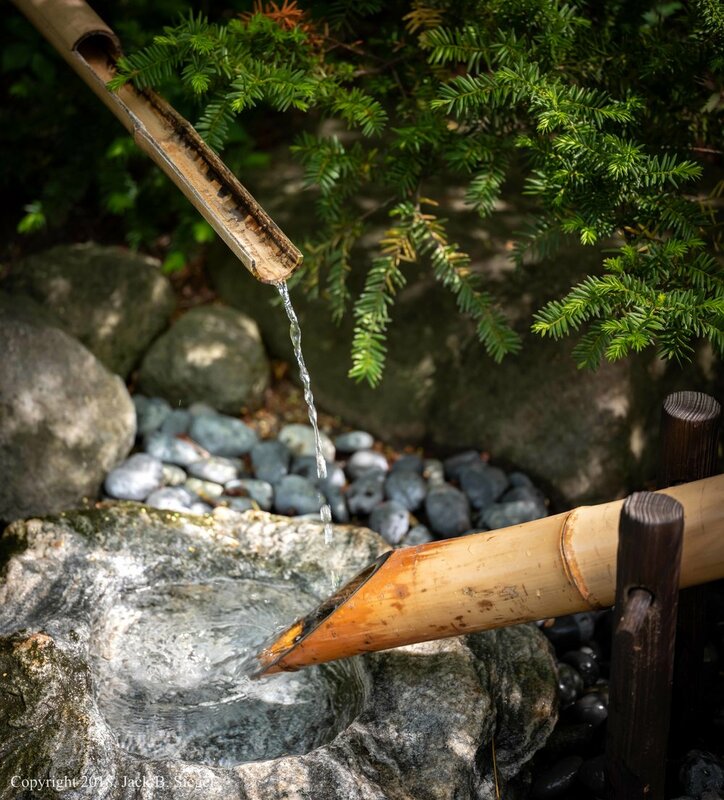 The waterfall obviously is a crowd-pleaser, but the real pleasures come from the stone lanterns, patches of irises and other flowers, and small statues strategically placed throughout the carefully contoured landscape. Many are easy to miss, given the foliage that partially obscures them. The gardens have a calming effect on all visitors, including the small children who accompany their parents in strollers and with small hand in large hand. During my four-hour visit, I don't recall anyone talking on a cellphone or glancing at a screen. It is easy to make a day out of a visit. I had hoped to have a bite to eat late in the afternoon at Fresco, the onsite restaurant, but it closes early (I believe at 3 PM). Instead, I had to settle for some candy and a drink purchased in the gift shop. I looked for my usual Diet Coke, but it was not to be found. Virtually all the drinks, chips, and candy bear Japanese labels, so I went local, so to speak. The mildly carbonated grapefruit drink and Oolong ice tea were both excellent. I do have one complaint. I can understand the goose "droppings" on the grass, but the Gardens' staff should hose down the stones in the center of the pond daily. Until that routine is adopted, Photoshop will have to suffice. After seeing the size of some droppings, Some visitors must surely be looking for the elephants that roam the grounds. The Garden is open 9 AM to 6 PM weekdays. On Saturdays and Sundays, it closes at 5 PM. It shuts down for the winter months, starting November 1, and reopens in late April. Check the website for exact dates. On Tuesday evenings (May 29 through August 28, 2018), the garden remains open for musical performances beginning at 5:45 PM. As I left the Gardens, a Tai Chi class was underway in the Pavilion. Down and Up, Then Repeat, Repeat, Repeat . . . 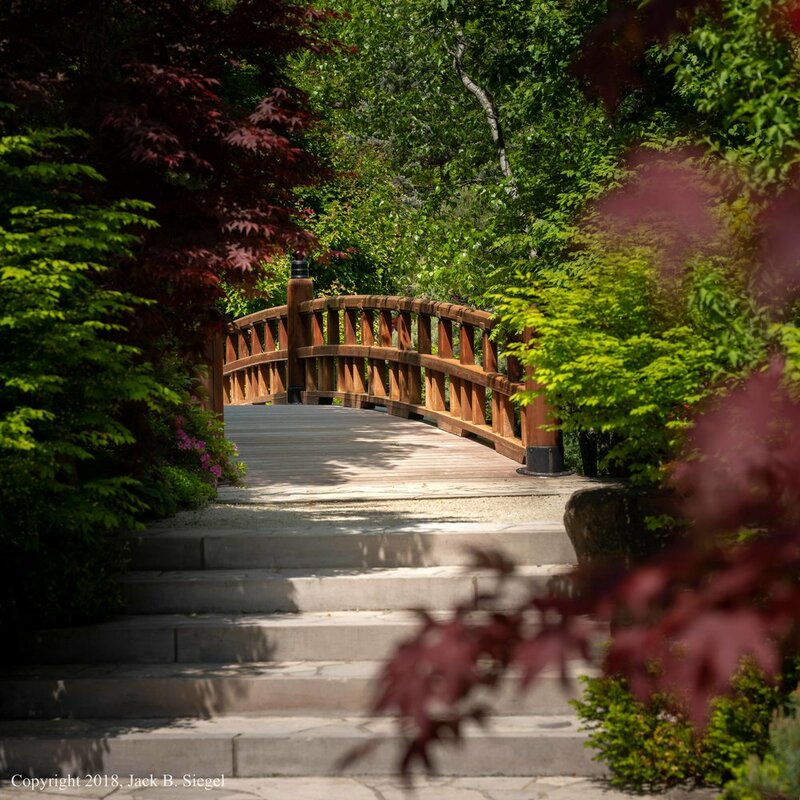 Photographer's Notes: My brief time in the Anderson Japanese Gardens demonstrates why one visit is rarely sufficient for any photographic effort. Some settings would make for interesting photographs, but the light isn't right or the foliage has overgrown the potential subject, thereby obscuring it--a small patch of flowers or statue was so obscured by foliage growth that sufficient separation was not possible even though the scene had plenty of visual appeal to the naked eye. It just didn't translate to a two-dimensional sheet of photographic paper. In other cases, morning light is the desirable light because of the angles. Strategically placed strobes might be able to fix the problem, but over-exposure by boosting the ISO or aperture is no substitute. In short, the Anderson Japanese Gardens require repeated visits. Phil, a very helpful docent, told me that the gardens look entirely different in early spring. I will be back--hopefully before next spring.